Boston Heights dates back to the 1800s when it was known as the Boston Heights Addition, a subdivision of Kansas City. The addition came into being when a real estate company surveyed the area to identify space to build homes. They selected the area because of its proximity to cable lines that ran from Prospect to Troost on Linwood Boulevard. In the 1970s Ms. Suevonia Stewart founded the Boston Heights Neighborhood Block Club. She was a pillar of strength closing drug houses in the area and initiating activities such as starting a paint program for residents and well as volunteer programs. As membership grew the name was changed to the Boston Heights Neighborhood Association. In the 1980s the association was asked to consider including the Mount Hope area, and over time, the two merged becoming Boston Heights/Mount Hope as it is known today. 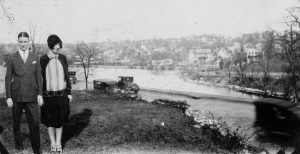 Boston Heights / Mount Hope is also home to Troost Lake, which was known as Troost Park back in the day. The original Troost Park opened in 1889 as an amusement park, and was located at the end of the cable car line at 24th and Troost. The park featured a boathouse and wooded areas where families could picnic and enjoy concessions. Boston Heights / Mount Hope has a longstanding relationship with Habitat for Humanity of Kansas City. Habitat KC has been building, renovating and completing home repairs in the neighborhood for nearly 30 years – impacting the lives of hundreds of families, including 31 in 2016 alone. The projects completed last year include four houses acquired from the Land Bank that were completely rehabbed for families in Habitat KC’s affordable home ownership program.